Learn more about the vineyard behind our champagne and the story of The Wolseley’s iconic glassware. Pommery ~ Champagne Pommery is located in Reims, France. It was in 1857 that Mr Pommery moved into the champagne trade (having made his fortune in the wool industry), yet he died a year later and his widow and then their children took over the reins. Hectares of land were purchased, the business began to thrive and in 1874 Pommery created the very first successfully marketed Brut Champagne. The original Pommery Domaine is still used in the production of all its champagnes to this day, including the 18 km of chalk galleries located 30m below ground where the maturation takes place. The Wolseley Champagne Flutes ~ Our fine crystal champagne flutes are designed exclusively for The Wolseley, to match our Rummer wine glasses. Rummer glasses became very popular towards the end of the 18th century and are characterised by a capacious bowl, a short sturdy stem and a wide foot. Our champagne flutes have a single knop in the stem and a hand formed base, which has been delicately engraved with The Wolseley monogram. 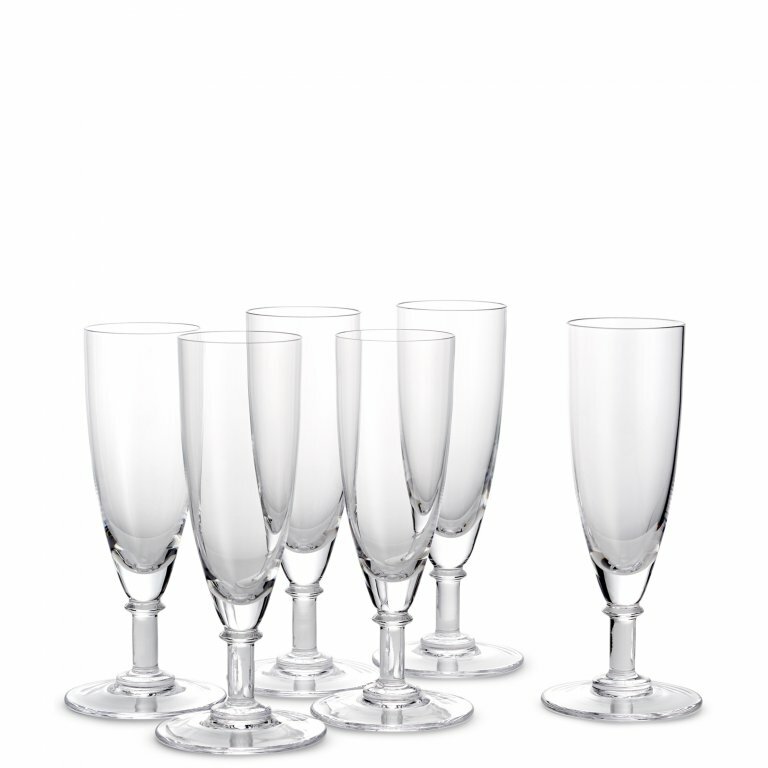 Produced in a glass factory that has been in existence for almost 100 years and considered one of the best within Europe, our crystal champagne flutes are made by hand using traditional glass blowing methods. Consistency of shape is achieved through the use of carved wooden moulds, made from a fruit wood such as pear, into which the bowls are blown. Our crystal glassware is lead-free, with the addition of a metal oxide to add a little weight and give the glass its wonderful colour and brilliance.